Many senior and top managers are of the opinion that you simply send your staff on a PRINCE2® training course and then put them to work on projects. This is not a good approach. There is a better way to develop higher level project managers. Everyone needs direction, guidance, a sounding board and a manager with credibility, to develop. Human resources are the most precious asset of an organisation – they enable the organisation’s leadership to achieve their corporate objectives. Investment in their competencies yields handsome returns. Their efforts can result in the realization of the benefits envisaged for change efforts. Project Management Essentials this is a basic introductory course for people with no previous project management experience. This course is optional. PRINCE2® practitioner is the globally recognised starting point for PM’s and carries international accreditation. Its scope covers the primary competencies required for project management. APM PM for PRINCE2® practitioners extends the competencies gained from PRINCE2® further and is also an examined course with international accreditation. Programme Management Essentials is a two day appreciation course enabling the delegate to better understand the interface between projects and programmes. If required the delegate can attend the formal MSP® (Managing Successful Programmes) course to achieve international accreditation. Managing Benefits Essentials is a two day appreciation course enabling the delegate to better understand that the purpose of change is focussed on benefits realization. The course outlines how benefits are monitored from project outputs, programme outcomes and business-as-usual. Benefits are to be nurtured and pursued with vigour. If required the delegate can attend the formal Managing Benefits course to achieve international accreditation. Agile Project Management introduces an optional approach to managing specific projects better suited for this alternative approach. An Agile Essentials course should be attended to understand this alternative approach. If required the delegate can attend the formal Agile Project Management course to achieve international accreditation. These courses should be scheduled over a period of time and separated with opportunities to experience the theory in the workplace. Question: What is the best path to follow, to develop top quality project managers? 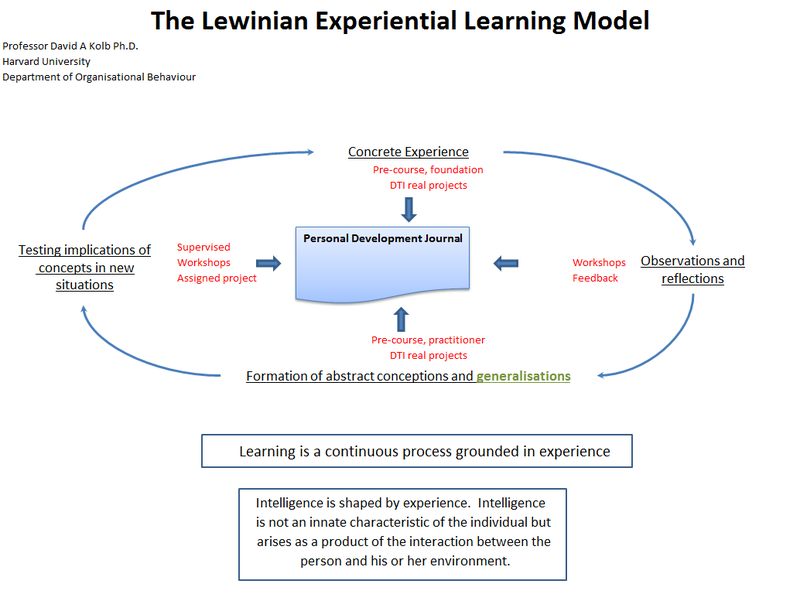 When the concepts researched by David A Kolb in his book “Experiential Learning” are applied, an important learning journey emerges. Learners learn best when provided with a supporting infrastructure in which to experience knowledge gained from attending courses. The following diagram summarises relevant information extracted from David’s book. Where there is insufficient organisation capacity to set up and sustain this structure, consideration should be given to acquiring external resources. Configuration Management: To overcome the burden of managing many project documents, the learner should be enabled to have access to them from a central point (e.g. computer screen). A sample system (P2Nav) is described in greater detail elsewhere on this web site. A document management system like MS Sharepoint of Documentum provides simple version control facilities and is user friendly. Project scheduling: Microsoft’s MS Project is a popular tool but there are others available. Learning is a continuous process grounded in experience. Relying only on a PRINCE2® course to set project managers free on an assignment, is a simplistic view that requires a more caring and realistic approach.